Cobalt is a big game powerhouse of a reel packed with technical breakthroughs. Cobalt features a dual-axis machined frame that dramatically strengthens the side that bears the most load. The foot is embedded—rather than perched—atop the reel to effectively transmit force and distribute weight. The large arbor spool is also machined with many subtle asymmetries that bring perfect balance without a counterweight. The power is in your hands with a "set drag" system of adjustment that allows you to set a preferred stripping pressure against a stop. Access the full range of torque in half-pound click stop increments through a single rotation of the drag knob, with increments etched into the knob for visual reference. 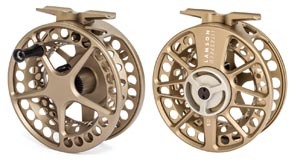 A coating as hard as type III anodize but with 20 times the protection against a saltwater environment, Cobalt is endowed with a stunning, shielding Micralox finish—exclusive to Waterworks—Lamson in the fly fishing world. The fifth generation of the legendary Litespeed boasts a higher retrieve rate and narrower spool for improved line handling. An integrated drag cassette for a stiffer frame. And an ergonomic drag knob. A new version of Lamson's Hard Alox provides a more beautiful finish. CNC machined in the U.S. from 6061 barstock aluminum and assembled in Boise, Idaho. 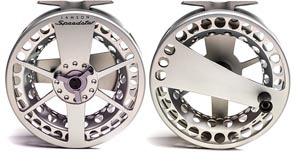 The Speedster is a super-high retrieve rate reel with a narrower spool, inboard mounted handle and an outer diameter significantly larger than Lamson's highest performing reels. The narrow spool prevents line barreling, the added circumference and inboard handle improve retrieve rate. 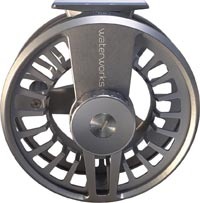 Mate these features with a time tested smooth as silk, maintenance free drag system, Classic Waterworks Lamson styling and attention to detail, and you have what the name implies: A Hotrod of a reel. Speedster HD ("Heavy Duty") follows the lead of the Guru HD reels by incorporating a full-cage design to capture line without failure. The full-cage design is the solution for thin-diameter running lines that are inclined to escape through spool/line-guard gaps. *HD spools are not compatible with standard Speedster. Guru has long set a standard for enlightened excellence as a rugged, fully USA-machined, and ultra-reliable reel at a great price. 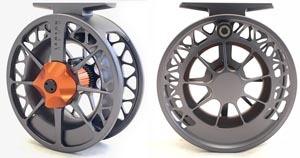 By increasing the arbour to a larger diameter and making the spool narrower—all the while decreasing its total weight and parts—Guru Series II takes it to another level. Lamson has updated the spool geometry for enhanced retrieve rates, opened the porting to reduce weight and improve line drying, and integrated the counterbalance. They even introduced a curved cross-section for structural stability. The HD in this reel stands for "Heavy Duty." The Guru HD has both a complete cage design and type II finish in a pewter-tan color. 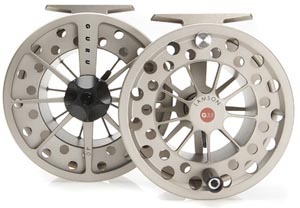 Guru HD is a phenomenal, affordable Saltwater and/or Spey reel. Steadfast and stylish, Guru has long set a standard as a rugged, fully USA-machined, and ultra-reliable reel at a great price. Lamson has updated Guru's spool geometry for enhanced retrieve rates, opened the porting to reduce weight and improve line drying, integrated the counterbalance, and introduced a curved cross section arbor for structural stability. When Lamson started creating Liquid, they focused purely on the virtues and advantages a pressure-cast process can offer. Structurally you can do things with casting that you can't machine, such as full radiused compound curves, near zero-radius inside corners, and for precise fit and finish you can go back and machine the cast part in critical areas amplifying the best aspects of the process. Lamson pushed back on other boundaries as well. 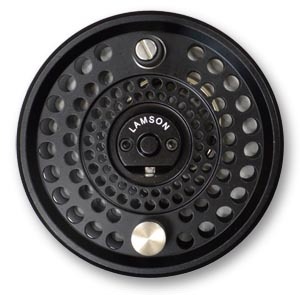 How much of a reel at this price can Lamson make in the U.S.? Quite a lot as it turns out, and it's a good mix. These high quality castings are imported, but the components critical to the drag system are CNC-machined in the U.S. 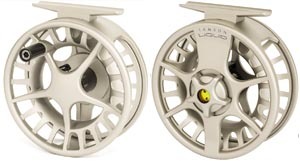 Liquid reels are assembled in Boise alongside their highest priced reels. No other reel in this price range can boast this much U.S. content and quality oversight. For years an iconic ultra-large arbor reel, Litespeed has now been refined for even higher retrieve rate, improved ergonomics, easier line management and less mass. Everything that was achieved in Gen 3 LS has been pushed farther. Narrower drag geometry has translated into a flatter spool surface for less knuckle dragging. A more aggressive drag knob has been made . . . well, more aggressive. Structural refinements such as the curved arbor have made a light reel even lighter, and this curved arbor (which we introduced in 1998) stores backing into a "diameter well" and keeps "working line" at a maximum radius to optimize everything we love about large arbor reels. Most notably, the spool/stripping arm geometry that was introduced on the very earliest Litespeeds has been changed to make it consistent with our newer reels, which do a better job of preventing snags and line damage. 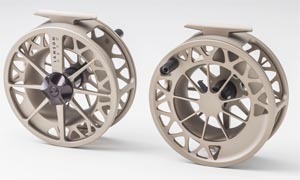 This reel stands for "heavy duty" and this version of Guru unlike thestandard Guru has both a complete cage design and Type II finish in a pewter-tan colour. 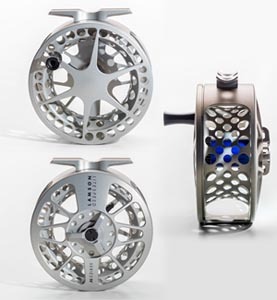 Guru HD is a great affordable Saltwater and Spey reel.